For someone not aware of the term yet, electrostatic precipitator is basically the process through which electrostatic forces are used to collect dust. These electrostatic forces generally comprise of collecting plates and discharge wires. An electrical field is created when a high voltage is applied to the discharge wires. Ions are also supplied as the gas around the wire also get ionised. Though being quite complicated, the principal of Electrostatic Precipitation is applied on an industrial scale. Since the device has so much to offer, make sure that the supplier you are approaching for durable and efficient electrostatic precipitators is indeed reliable. This will give you the assurance that the Electrostatic Precipitator Spares offered by them are of the highest quality and the device can last for years to come even with minimal maintenance. Their professionals are also aware of all the factors on which the dust collection efficiency of the device depends. The normal the resistivity area will be, the higher will be the dust collection efficiency of the device and the process will be more stable. On the other hand, particles have a higher chance of losing their charge on their arrival at the collecting plate if they are in some low-resistivity area. This means that the particles again enter the dust collection area and the efficiency of the device reduces. Even in a high-resistivity area, its dust collection efficiency reduces with an increase in the electrical resistivity of the dust. This is why you need to consider the electrical resistivity of the dust when determining the right model of the electrostatic precipitator or its spares. The particle size of the aerosol you are willing to collect in the electrostatic precipitator also determines its dust collection efficiency. When performed on aerosol with particles of different sizes, the collection efficiency of the large particles will be higher while that of the small particles will be lower. You need to consider the size of both the aerosol and the device if you want to get specific dust collection efficiency. Using a bigger device means the treating time will increase and so the process gas will take more time to pass through it. Since the aerosol comprises of both dust and mist, the concentration of gas in it also differs. The dust collection efficiency of the device is largely dependent on the aerosol concentration. If you want the value of aerosol concentration to remain the same at the outlet of the device, the aerosol concentration should be higher at the inlet. Sometimes, its dust collection efficiency can reduce inspite of the aerosol concentration being higher at the inlet if the sizes of the particles are small. Since you are now aware of the prime factors determining the efficiency of an electrostatic precipitator, it’s time you start looking for a reliable company offering the device and its spare parts at affordable prices. Pollution, particularly air pollution has been a bane to the world for many decades now. With rapid industrialisation that is underway in most countries right now, air pollution is at an all-time high with no sign of decreasing any time soon. Fortunately, there are certain devices that control air pollution and effectively ensure that it does not reach alarming proportions. Discussed below are the different types of devices for controlling air pollution about which you should know. What a cyclone separator does is to basically use inertia to get rid of particulate matters from the gases that go out of the ducts, or flues. These devices work on the principle wherein the flue gases go into a chamber that houses a tornado-like vortex. Due to the difference in weight between the light gas particles and the larger particulates, the former goes up the cylindrical chamber and exit while the heavier and larger particulates impact with the walls of the chamber and fall down. This is considered by many to be the best device for controlling air pollution. An electrostatic precipitator or ESP works by using static electricity to separate ash and soot from the fumes, before letting it go out of the pipes and ducts. The particles of carbon that are left unburned are extracted out of the smoke with the help of the static electricity within the precipitators. With the help of electrostatic precipitators’ spare parts, one can ensure that they are never letting out polluting gases into the environment. One of the most basic forms of air pollution control devices, fabric filters, as their name suggests, uses some sort of fabric (usually felt) to trap the particles of dust before the gas goes out from the smokestacks. In comparison to the previous two methods, this technique may seem rudimentary, but it is quite effective nonetheless and does its job rather well. Another device that is true to its name, incineration involves the conversion of VOCs, volatile organic compounds into CO2 and water through the means of combustion. This combustion occurs in specialised equipment known as ‘afterburner’. The afterburner is made in such a way that it can create the necessary conditions for combustion, including the high temperatures that are required. There is a theory that states that carbon dioxide can be captured and stored in geologic layers to prevent it from going out into the atmosphere. A carbon capture device puts this theory into practice. However, this is one of the more rarely used techniques but there are discussions about it constantly as a means to curb the emissions of greenhouse gases. These are the types of air pollution control devices that are most extensively used. Their necessity in today’s world is unquestionable, and any way to limit air pollution should be considered and put into practice without too much thought. 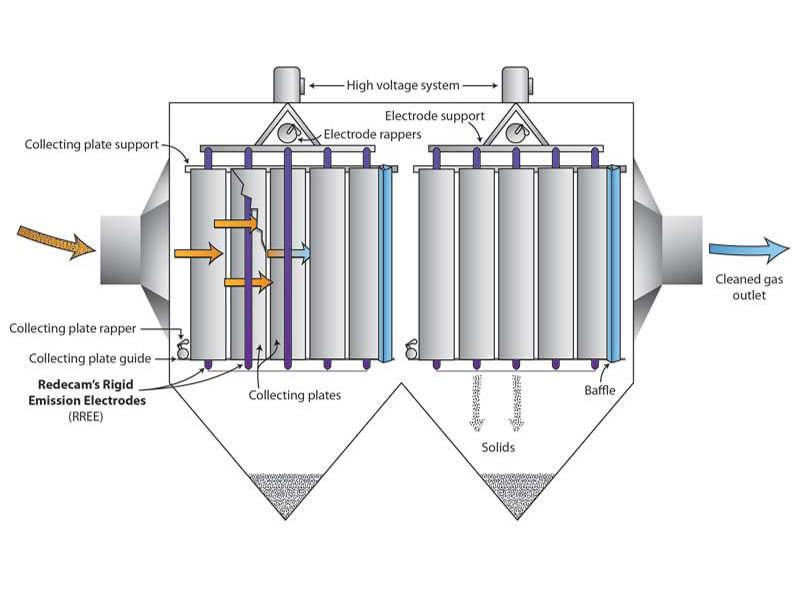 The easiest way to remove particles from a gas stream is by using an electrostatic precipitator. Electrical energy is used to charge those particles negatively or positively before they get attracted by the collector plates which are generally of the opposite charge. The collected particles become dry in the collector plates and can be easily removed or washed with water. Not everyone using the procedure is aware of the fact that the collection efficiency of ESPs is more than 99 percent and this is why they are widely used in various industries. The four common components you will generally find in an electrical precipitator are discharge electrodes, rappers, collection surfaces and gas distribution plates. These plates comprise of numerous plates which are perforated to maintain and properly distribute the air entering the gas stream. The discharge electrodes in a majority of the ESPs are divided into 3 or 4 fields. The larger electrodes are divided into around 14 fields which are generally found in series. A solo transformer-rectified set power supply is sufficient to energise those electrodes and create ions. The ions dashes with the particles in the incoming gas stream and applies an electrical charge. The charged particulate matter then collects on the plates or pipes which can be later removed using the rapping system. There are generally two types of ESPs, namely dry ESPs and wet ESPs. What differentiates these two is the method through which the plates where the particles collect are cleaned. Vibrations or mechanical impulses are used to loosen the collected particulate matter and clean the dry ESPs from the collection plate. To remove wet ESPs, you have to rinse the collector plate thoroughly using water. Using this wet method becomes necessary when the particles accumulated in the gas streams are sticky and have low resistivity. For someone not aware of the term, ‘particle resistivity’ is basically the property of the particles that can influence the process through which they deposit or is removed from the collection plates. This is why resistivity of the particles can affect the performance of Electrostatic Precipitators drastically. Moderate resistivity is regarded to be the ideal situation when the particles can automatically accomplish some of their charges after reaching the collection plate. This prevents the inhibition of other deposited particles and makes them capable of retaining their charge while holding them lightly on the plate. It takes longer for the particles to conduct away their charge if the resistivity of the particles is higher. As a result, a negative charge builds up on the plate which inhibits the other deposits. If the resistivity is too low, the particles will start losing their own charge once they reach the collection plate and start attracting charges from the plate. This will make the negatively charged particles deter back into the gas stream. Since your knowledge about electrostatic precipitators has enhanced, it’s time you start looking for a reliable company who can take care of all your ESPs needs.